Good morning…temperatures as I start typing this are in the 50s(!) already…in actuality we never dropped below 50° this morning…and despite the clouds during the 1st part of the day, enough PM sunshine should allow a warm-up into the 60-65° range before the afternoon is done. The record high today is 69° set back in 1970. We’re also running more than 7° above average for the 1st third of the month. Friday: Mostly cloudy, breezy and mild with highs again in the 60s. There may be a few patches of drizzle in the area. Saturday: Rain developing towards the end of the day especially. Heavier Saturday night. Mild with highs in the 60s again. My goodness…it will change for a bit of time next week, but this mild weather is still an ongoing thing…and may linger into early Sunday before a chillier (really barely seasonable) air mass arrives. Colder weather will move into the area on Tuesday and linger for the rest of next week…again just a seasonable turn. The early morning weather map shows a weak cold front moving towards the area. This will slide through uneventfully with the exception of switching the winds around and dropping the breeze as the late morning moves along. Notice the air behind the front is still NOT overly cold for December. You can see the warmth over the last couple of days on this temperature trace via IA State. That’s some warm air across the US/Canada border area. Amazingly International Falls, MN has had only about 4″ of snow since 10/1…some 16.5″ below average for the season So far. Williston, ND, has had 0″…about 11″ below average into early December. Only about 7% of the US has snow on the ground…compared to about 18% last year on this date. 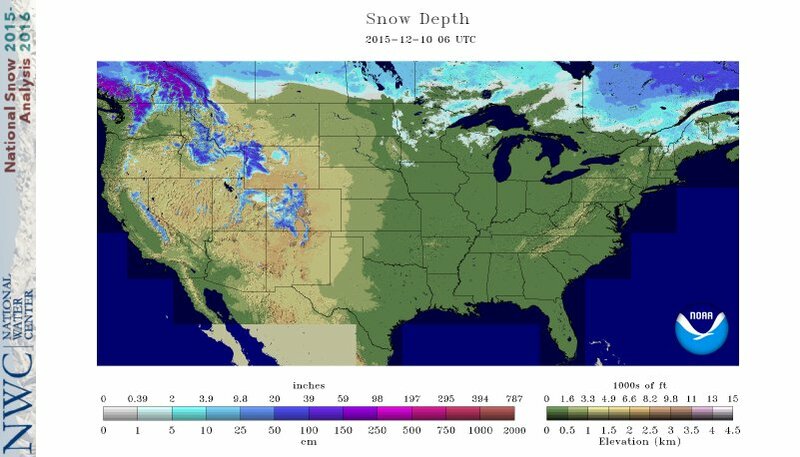 Average snow cover over the previous 11 years is 32%…needless to say…not so good with the white stuff so far. Other lows were in 2005 and 2014 with apprx. 19% while 2013 had 63% on this date. The POR (period of record) is very small so the sampling size is not great…you really can’t take a lot from that number compared to weather history of the last 50 years…but it’s still interesting. Now can we add anything to the nationwide or even local snow cover over the weekend. Locally it will be really tough…although I still think the potential for at least some mixed in snowflakes, if not a turnover in N MO is still there for later Sunday evening into very early Monday. Accumulations though will be tough with temperatures in the mid 30s or so. Still something to monitor and not give up on. That storm will come into the US…and split up somewhat. Then as it does so one of the pieces will drop into Nevada and then come out through the Rockies later Saturday. In response a surface low will develop in the western OK Panhandle and come out through the Plains and pass near the KC area on Sunday on it’s way towards Green Bay, WI first thing Monday morning. Copious moisture will come northwards, and while the thickest moisture will be off on the MO side, the dynamics of the storm should allow for 1-2″ of rain to fall SAT night>early MON AM. On the backside of the storm in the “wrap-around” region, the atmosphere is going to try to cool down. It may in fact be supportive of snow to form for a short time later Sunday evening only IF the storm is strong enough to “chill” the atmosphere on it’s own. This process is called “dynamic cooling” and should it occur, at the very least some wet snowflakes could form. The timing, should it occur at all seems to be roughly from 9PM Sunday to about 3AM Monday or so for the KC area…I still think this can’t be taken off the table. Surface temperatures though should be in the 34-36° range so again accumulations would be a tough thing around the KC area…let’s keep an eye out for the northern part of MO and NE KS though…where the precip may be a bit more on the heavy side…meaning IF the changeover even happens up there,a s well, it may come down hard enough to support something minor sticking (slushy maybe?). It’s certainly NOT a for sure thing…and for snow lovers, this is really a waster of a storm. There should be a stronger push of chilly (seasonable) weather later Tuesday for the rest of next week before another warm-up occurs later next weekend into at least the early part of Christmas week. I should note that we should watch for another system later next work week before we try and transition back to milder weather. We will have some colder air around for that next system, perhaps next Friday, to work with. Statistically though the odds aren’t great. OK that’s it for today…the newest NAM model is trying it’s darnest to generate at least a few flakes around here Sunday evening it appears. Good blog, Joe. A shame I didn’t read it until 6 pm! I’d like to see snow Sunday night for my daughter’s sake, but I’m still not too optimistic. Still, like Jim Carrey says in “Dumb and Dumber,” so you’re telling me there’s a chance! Hoping future model runs keep storm at high intensity, rapidly intensifying as it passes us, and nudges 850 mb low track a little farther southeast. Then there’s the (very slim) chance of a “December Surprise” ala the October 1996 snowstorm that no one saw coming until it was upon us. Hard to believe a December storm with such intensity and such a track doesn’t generate a swath of snow nearby.